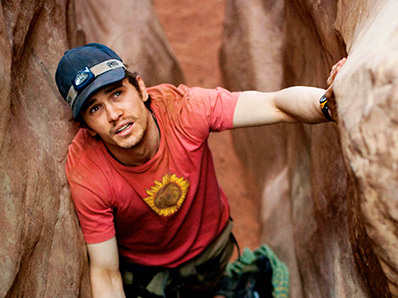 Earlier today, Fox Searchlight finally debuted (in EW) the first photo (or two) of James Franco as climber Aron Ralston in Danny Boyle's newest film 127 Hours. We've been talking about this film a lot over the last year as it's not only Boyle's follow-up to Slumdog Millionaire, but it's another one of those one-man-show kind of tense thrillers. Ralston (Franco) was the climber who had to cut off the lower part of his right arm by himself with a dull knife in order to free himself from being pinned by a boulder in a Utah canyon. The title refers to the amount of time he was stuck. Boyle still calls it "an action movie where the hero can't move." Fox Searchlight recently scheduled 127 Hours for limited release starting on November 5th later this year. I'm already getting a bit tense just thinking about the kind of pain and experiences we're going to see Franco go through. "This movie is going to be obsessive, and it will be for obsessives," Boyle stated. "You will want him to cut off his arm by the end." In addition to Franco, the cast includes Lizzy Caplan, Kate Mara, Amber Tamblyn and Clémence Poésy as his girlfriend. It also had two cinematographers, Anthony Dod Mantle and Enrique Chediak, who will follow Ralston through first-person POV dialogue in some scenes. This is one of my most highly anticipated films left to see this year and I can't wait to see it an upcoming festival. You too? Can't wait to see the trailer. this sounds interesting - i love movies and books about climbing (primarily about high altitude climbing). so, this definitely has caught my eye - looking forward to a trailer. i like boyle and franco, but this just sounds dull. i'd be keen for boyle to do more original stories with alex garland. good combo. I'm really interested to see this. It'll be a competition between him and Ryan Reynolds to see who is better at making the audience freaked out and claustrophobic. Aron Ralston is a true badass, it's about damn time he was recognized for it. looks very interesting. i'm looking forward to it. knowing what this guy went through, it should be a very gutwrenching scene where he realizes what he has to do to survive. I think this film will be very hard to pull off, but if anyone can do it it's Danny Boyle. Having two DP's is a very good idea for such a beautiful, yet deadly, setting. @Darren yes he did. Franco lucked up with Pineapple Express, and thankfully his career is on the move. Can't wait to see what what He and Boyle have to offer. i loved sunshine too! i didn't know he directed that. slumdog was ok, but i wasn't wowed by it. The first time I saw Slumdog it was amazing! The second time it was kinda boring. To be honest the only reason I went to see it was because in the trailer they used "Hoppipolla" by Sigur Ros. S Sunshine was amazing though, I mean Cillian Murphy, Chris Evans (Showed that he can actually act! ), Mark Strong, Rose Bryne, Cliff Curtis, Michelle Yeoh, and Hiroyuki Sanada! Can you say "BEST CAST EVER!" I think one can.